Introducing the Ignite Your Legacy™ Mentoring Programs! 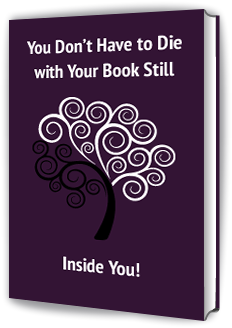 Do you know (or even hope) that you have a book inside you – just waiting to come to life? Be fully at home with yourself? Create a legacy that reflects who you REALLY are? Turn your tragedies and challenges into words that can help others? Live life with NO regrets (or as few as possible)? Write and publish that dream of a book that has lived inside of you? Writing a book is one of the biggest adventures in life! And, it can be a daunting task. 80% of the population says they have a book inside them. Yet, only around 2% actually ever write that book! There are so many reasons people stop. I am here to champion you in expressing your words and getting YOUR message out in the world so you don’t have to die with your book still inside you. Introducing Author Your Brilliance™ and Ignite Your Legacy™ Mentoring Programs! As a literary agent, a bestselling author, a publisher, a coach with a masters in Counseling and 30 years in the field of personal development, I am passionate about guiding women through the book writing process with ease and (let’s just say it) even fun! The potential of legacy exists in all of us. Its fire burns in our soul, yet it’s often ignored. If we run from the heat, we may never know why we are here. We must ignite our legacy by telling our stories and owning our wisdom. If we don’t, the flame will eventually die out – and take some of what is essentially us with it. Ignite Your Legacy: Live Like it Matters. Write Your Book So it Does. Please note: my typical clients are women over 50 who have walked through the fires of life and desire to leave (and live!) a lasting legacy through writing a book. If you don’t fit that description, we can still talk – but you gotta be willing to dig deep! To find out more, please apply for a free 25-Minute Mastermind consultation. You can fill out my online application. Watching Kristen work with my wife Inga has been a delight. She has brought out the best in Inga’s expression and raised her confidence to a level I am proud to say is producing the memoir I have seen in her for years. It seems like they are always having so much fun – while getting work done too. Thank you, Kristen.